Can you believe I've had this blog for a year now? Actually, I'm a day off since my very first post was on 29th February, but I don't think I could have waited another three years before celebrating with all of you. When I first started the blog, I wasn't sure if I could keep it going (it's actually a bit of work), but I've had a lot of fun updating and sharing my projects with everyone. I hope that I will be able to post more projects, tutorials, challenges and prize give-aways for the coming year. To celebrate the one year mark, I'm doing a give-away. I went through all my lovely kits and chose one which I think you will love. 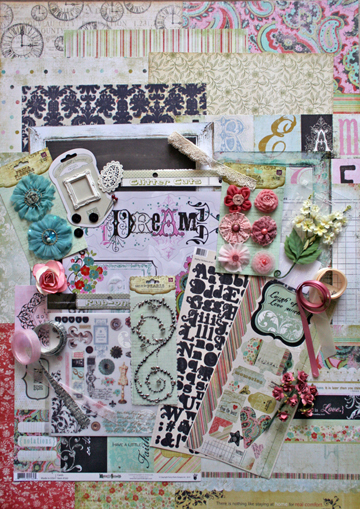 This is a full past kit from MCS, that features Fancy Pants papers, lots of Prima flowers, stickers and ribbons. All you have to do is answer a few questions, and send me the answers in an email. 1. How many posts have I made, up to this one, on this blog since I started it? 2. Which Hong Kong scrapbook shop do I design for? 3. I have another passion apart from scrapbooking. What is it? Email your answers to callibeescraps@gmail.com. Deadline is midnight of 7th March, 2013 (HK time). I will then randomly draw a winner who will receive the above prize pack. Entries open to Hong Kong residents only. Looking forward to giving this kit pack away.